Zig Memory System Sets are a great way to start or expand your marker collection. They also make great gifts! 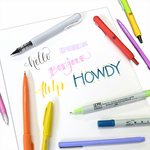 Find them in various color combinations, with many sets being completely unique to Marker Supply. The plastic wallets and cases help keep your markers organized. Empty storage cases are also available so you can build your own custom set!